During his visit to London in 1848 Chopin stayed in Dover Street a couple of doors up from No 40. Unfortunately this house is no longer there, having been bombed in the war. However, the Arts Club is typical of houses of this time and has a concert room decorated in opulent Victorian style, which is why we have chosen it for some of our events this year. 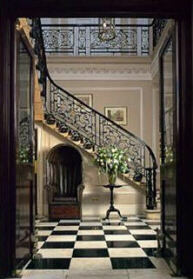 The Arts Club was founded in 1863 by Lord Leighton and Charles Dickens. Since then it has numbered many eminent authors and artists amongst its members, including Anthony Trollope, Arnold Bennett, Dame Laura Knight, Sir Alfred Munnings, Bram Stoker, Camille Pisarro, John Piper, David Hockney (see the Arts Club website: www.theartsclub.co.uk). By bus: Nos 9, 14, 19, 22 and 38 run along Piccadilly and pass the bottom of Dover Street. Alight at Green Park. Dover Street is almost opposite The Ritz. The Arts Club is on the lefthand side opposite the junction with Stafford Street. By underground: The nearest stations are Green Park (Piccadilly, Victoria and Jubilee lines) or Piccadilly Circus (Piccadilly and Bakerloo lines). From Green Park tube follow the directions above. From Piccadilly Circus tube take the exit marked Piccadilly North Side. Coming up the steps walk straight ahead, and turning into Piccadilly continue past the Royal Academy and Burlington Arcade, and on until you reach Dover Street (approx 6-10 minutes). The Arts Club is half way up on the left, opposite the junction with Stafford Street. By car: Parking on single yellow lines and on meters only (no charge on Sundays). No parking in Residents' Parking spaces. There are lots of meter spaces in Berkeley Square (approx 6-10 minutes walk). There is also a NCP car park in Arlington Street. No congestion charge on Sundays.